Post here for discussions on the Jedi Knight class. A wall between the Republic and its enemies, the Jedi Guardian stands firm in the face of overwhelming odds and dares opponents to attack. Perfect concentration and use of the Force allows smooth movement even in heavy armor--making the Guardian a hard target to take down. Leaders on and off the battlefield, Guardians also inspire allies to amazing feats, making them invaluable for conflicts of any size. All Jedi Guardians learn to move in heavy armor and build extra energy to perform spectacular feats. 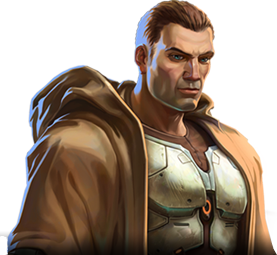 Guardians can opt to learn Vigilance, developing attacks that power through weaker opponents with ease and concentrating on fewer strikes that hit harder; Defense, redirecting enemies' attacks against the Guardian's allies toward the Guardian's sturdy self; and Focus, specializing in advanced Force techniques to increase the potency of lightsaber attacks and perform telekinetic feats to hamper opponents. Control and focus are the hallmarks of the Jedi Sentinel. Through years of training, Sentinels learn the art of using two lightsabers in tandem to create an intricate web of damage almost impossible to evade. By manipulating the Force, Sentinels can see holes in the enemy's defense, potential flaws in their own techniques and how best to plan for both. All Jedi Sentinels can wield two lightsabers in combat, using speed and precision to strike enemies where they are weakest. Sentinels can opt to learn the ways of a Watchman, becoming a peerless lightsaber combatant and using the Juyo form to debilitate foes; Combat, taking advantage of the Sentinel's lighter armor and using the agile Ataru form to perform incredibly swift strikes; and Focus, specializing in advanced Force techniques to increase the potency of lightsaber attacks and perform telekinetic feats to hamper opponents.